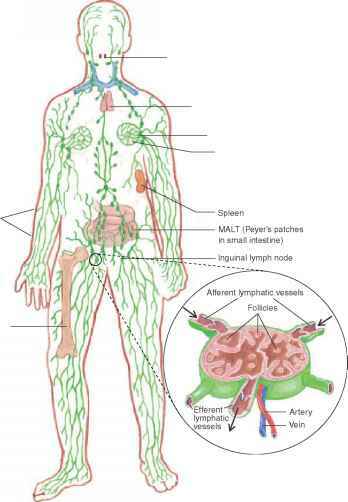 Figure 16.2 Anatomy of the Lymphoid System Lymph is distributed through a system of lymphatic vessels, passing through many lymph nodes and lymphoid tissues. For example, lymph enters a lymph node (inset) through the afferent lymph vessels, percolates through and around the follicles in the node, and leaves through the efferent lymphatic vessels.The lymphoid follicles are the site of cellular interactions and extensive immunologic activity. Bone marrow tion; this causes a corresponding increase in the antigen-containing fluids that enter lymphatic vessels. Secondary lymphoid organs are the sites where lymphocytes gather to contact the various antigens that have entered the body. Examples include the lymph nodes, spleen, the tonsils, adenoids, and appendix. They are situated at strategic positions in the body so that defensive immune responses can be initiated at almost any location. For example, lymph nodes capture materials from the lymphatics, and the spleen seizes materials from blood. The secondary lymphoid organs are like busy, highly organized lymphoid coffee shops where many cellular meetings take place and information is exchanged. The anatomy of the organs provides a structured center to facilitate the interactions and transfer of cytokines between various cells of the immune system, including lymphocytes, dendritic cells, and macrophages. No other places in the body have the structure necessary to facilitate the complex interactions required, which is why these organs are the only sites where productive adaptive immune responses can be initiated. 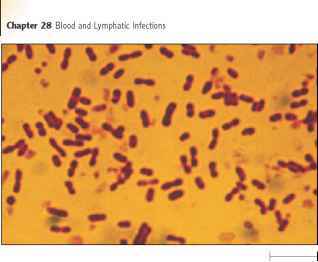 When lymphocytes make contact with a given antigen and receive the required "second opinion", they respond by proliferating to form clones of cells specific for that antigen. The metabolically active and dividing lymphocytes have larger nuclei and more abundant cytoplasm than their resting counterparts. The familiar lymph node ("gland") swelling that occurs in nodes draining a site of infection, as in the neck area during an episode of sore throat, represents the dividing lymphoid cells actively engaged in an adaptive immune response against the offending agent causing the infection. Some secondary lymphoid organs are less organized in structure than the lymph nodes and spleen, but their purpose remains the same—to capture antigens, bringing them into contact with lymphocytes that have gathered. Among the most important of these lymphoid organs are the Peyer's patches, which sample antigens collected from the small intestine, allowing presentation of the antigen to lymphocytes below the mucosal surface (see figure 19.6). M cells, specialized epithelial cells lying over the Peyer's patches, collect material in the intestine and transfer it to the lymphoid tissues beneath. Peyer's patches are part of a network of lymphoid tissues called mucos-al-associated lymphoid tissue (MALT). These play a critical role in mucosal immunity, the element of adaptive immunity that prevents microbes from entering the body via the mucous membranes. Collections of lymphocytes under the skin are called skin-associated lymphoid tissue (SALT).